As most you you know I am a massive Courtney Summers fan! I have loved each of her books and can't wait to read her next one. In the meantime, What Goes Around - a bind up of the fabulous Cracked Up to Be and Some Girls Are - is being published 3rd September. If you haven't read these yet - get reading! Honestly, they are so good! * Book will be sent out by the publisher - please only enter if you are happy for me to pass on your address details to them. I keep getting confused and thinking this is a brand new Summers book-instead I have to keep reminding myself that it's a bind up...that of course I totally want! 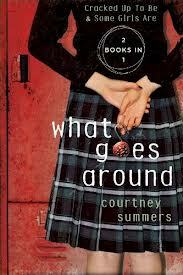 I seriously need this!Courtney Summers is my all-time favourite author!